Am glad to share news of my book signing at Chandler's Ford Railway Station on 8th July between 9.30 am and 12 noon. Many thanks to the Three Rivers Rail Community Partnership for their support. A selection of short snappy tales which will have you on the edge of your seat. There are short and longer tales on themes from fairy stories with a twist, to the supernatural, at times pleasingly humorous. Allison’s work has also been published on CafeLit (http://cafelit.co.uk) and on Shortbread Short Stories. She also publishes some pieces on her website Fairytales with Bite website www.fairytaleswithbite.weebly.com). 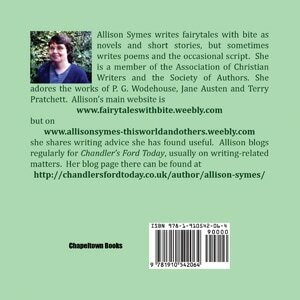 She shares writing tips on Allison Symes - This World and Others website (www.allisonsymes-thisworldandothers.weebly.com). Her favourite authors are Terry Pratchett, Jane Austen and P.G. Wodehouse. Chapeltown is an innovative indie publisher based in Manchester. We’re always prepared to take a gamble on the unusual. Am pleased to share the link to my book page. Just uploaded tonight on it is the fabulous book trailer produced by Chapeltown Books. Am delighted to share an extract from the Press Release for the book, which sums it up beautifully. Allison Symes’ debut collection of flash fiction From Light to Dark and Back Again. There is also now a Facebook page for the book. More details soon. I plan to write a Chandler's Ford Today post looking at my book launch and what I learned from it. Will share here once written. This post was written and went up on 14th April. Hope other writers find it useful as I share thoughts and tips on preparing material in advance amongst other things. Glad to share some of the Amazon reviews here. Thanks everyone who has reviewed so far. Really pleased to see the comments about the stories being ideal for reading while on a journey etc as I feel this is one of flash fiction's strengths. Ideal for the quick read. My huge thanks go to Chapeltown Books and Cafelit for hosting the launch and for guiding me through the process. It was a fun event and thank you to all who came and supported it. Naturally I shared links to this website so if you are new here as a result of the launch, a very special welcome! I shared writing tips, how I began writing flash fiction and talked about my blogging work for Chandler's Ford Today. Thrilled books were sold and I would also like to thank here those who have reviewed it so far. I learned a lot from today and hope to write a future Chandler's Ford Today post about it. I loved the virtual food and drink aspect too - just as well pixels don't contain calories! My congratulations also to the prize winners of the quiz and raffle and I look forward to sending you your prizes soon. My next task will be to set up some "physical" book launches but today made a marvellous kick start to my "campaign". The promoting side of writing is an ongoing task but it should always be fun. People will respond positively to that kind of attitude rather than the hard sell and given you will spend so much time on this side of thing you, the writer, should enjoy it. Anyway, thanks again to all. It was a really good day. Am delighted to announce that From Light to Dark and Back Again will have its cyber launch on Saturday 1st April 2017 from 10 am to 6 pm UK time. All welcome! More news as and when I have it. Please see my Facebook page for more details though a screen shot of the event is above. My Chandler's Ford Today post this week is about the publication of From Light to Dark and Back Again and what this means for me now as a writer. I have had various "firsts" on the way to this very special first. My route to publication has been a series of steps, some small, some very significant like this one, and others where I learned a lot and, as a result, helped me make progress in writing overall. I am thinking of my regular blog posts for CFT in particular as that has given me a love for writing non-fiction and very good practice in writing to a deadline! I share my thoughts on how vital it is to accept that you are in for the long haul when it comes to getting work out there, what I love about writers' generosity with one another when it comes to sharing news of books out and so on, and I confirm that persistence really does pay off. From Light to Dark and Back Again is a collection of my flash fiction pieces ranging in mood from humorous to criminal to borderline horror stories, hence the title of the book. Some of the pieces have been published online at Cafelit, others are brand new for this collection. There are 100 words stories in here plus those of 500 and above but none go above the traditional flash limit of 1000 words. Quick, quirky fiction to suit all moods! Some of the stories go back a while, others are brand new but when Chapeltown Books advertised they were looking to bring out single volumes of flash stories, I knew I had to give it a go. I collated the stories I already had, wrote more and was pleased to find before I knew it I had a collection ready to offer. I was even more pleased when the collection was accepted! Each story reflects my fictional loves - humorous fantasy, poetic justice tales, character studies and so on. Cafelit were the ones to get me into writing 100 word stories as they regularly publish these and writing to such a tight wordcount is an excellent discipline. I found I had stories which were way too short for standard competitions so sent them in. What lead me to writing? I've loved stories and books for longer than I care to remember. It has been a dream for years that one day I would have books on my shelves with my name on the outside cover. From Light to Dark and Back Again is hopefully only the first of these! What is my inspiration for my characters? I often base my characters on a trait and then use that to explore what those characters could be capable of when pushed to it. Sometimes I will want to explore why a character would want to act nastily and to see how they would justify this. Other times I want my stories to amuse and entertain so the character has to fit in with that. Some characters are based on a composite of those I've know, others I can imagine I could've known. Why write in this genre? I have always loved the fairytale world for its directness, its strong sense of justice (right generally will be done in the end, so unlike life! ), and being able to use allegory to share meaning has always had a huge appeal. My earliest favourite book was The Reader's Digest Complete Fairytales in two volumes, which had the original stories by Grimm, Andersen and so on. I still have these books - the spines are taped up for support!